This image you may have seen on our FB page. 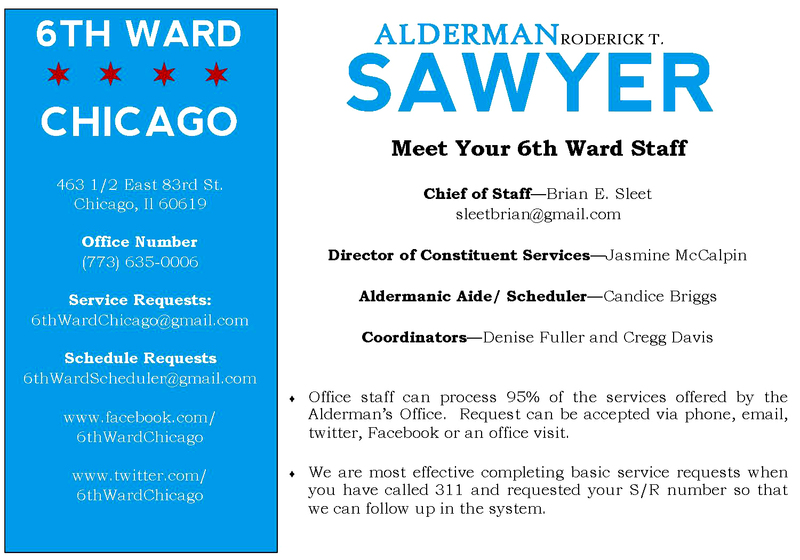 The information you see here was provided at the May 21st Greater Chatham Alliance meeting featuring Ald. Roderick Sawyer and his staff. FYI, Worlee provided a review of that GCA meeting at Concerned Citizens of Chatham! To be sure, it's quite innovative to use Twitter or even Facebook to send service requests. 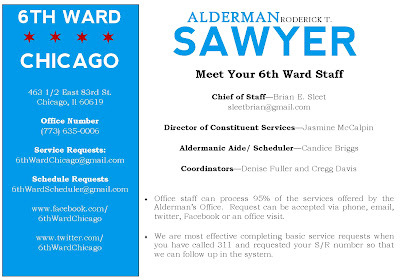 Currently the "new" 6th Ward Service office has Twitter (@6thWardChicago) and Facebook (6th Ward Chicago) accounts. It's already being utilized for the purposes of letting people know what to do as far as service requests. 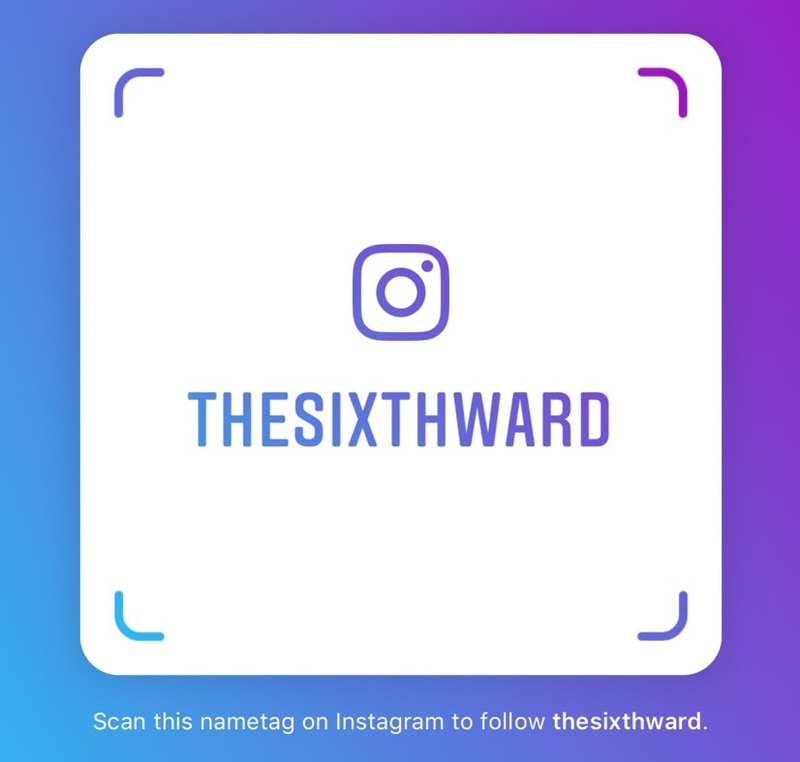 For example with the recent weather the 6th Ward Chicago Twitter account is already urging constituents to call 311 in addition to either tweeting them or sending a direct e-mail to 6thWardChicago [AT] gmail [DOT] com to report downed trees or flooding. The main thing however is that at the GCA meeting Ald. Sawyer's chief of staff, Brian Sleet, urged those in attendance to call 311 and then be sure to get a service request number so that the service office can follow up on it. If the person you're on the phone with has no idea what you're talking about ask for someone else who can provide it for. BTW, on that point certainly you have seen that here thanks to our very own JP Paulus. He was talking about following up his service request through then Ald. Lyle's office. At the meeting GCA offered attendees a form that the organization would forward to the 6th Ward Streets & Sanitation superintendent. Something I will post here so that perhaps other community organizations either at the neighborhood level or even the block clubs may be willing to copy in some way or shape. I thought this was pretty innovative of GCA. Leslie Honore of GCA relayed that at least 100 people who attended this meeting with Ald. Sawyer and his staff had turned in these forms. This is out of 308 who attended that meeting on May 21st. Also Ms. Honore provided photos of the meeting that I had posted on our FB page with attribution to the photographers.